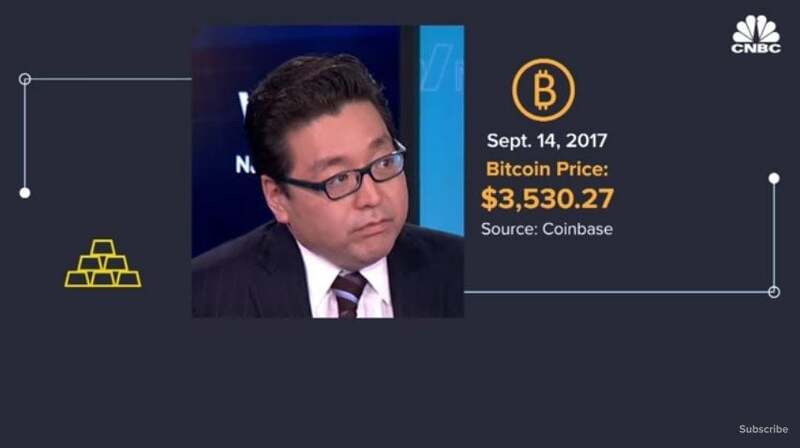 Crypto bull Tom Lee was an early evangelist for the digital currency. Here’s a look at the evolution of his calls on bitcoin during its epic boom and bust. I unequivocally believe big point is your best investment to them that. So the way people in the 80s treated gold is the story because they never trusted dollars. I think another generation of people think of bitcoin and the block chain in imbeds is a store of value. If it's 5 percent of Scholtz in five years it's 25000 per unit. This is a very risky investment. When we talk about 25000 we don't recommend anyone put 100 per cent of their holdings in this industry in the short term I think you can think about. How bitcoin is valued based on you know Wallich growth in transaction activity. The United States imports abuse of it in terms of being an actual currency. That's right. It captures five per cent of just the gold market it's twenty five but five percent seems like an awfully small number. Let's say it's 10 or 15 then you know Bitcoin could easily be in thousand dollars. This is a millennial story. So you know the average millennials to 25 today. The Boomers were 25 in 1982. So what did the Boomers drive from 1982 to the peak population of the boomers. Was 99 at some point by one. There's a lot of concerns recently about bitcoin being off its highs. I think it's a really healthy and saw the. Actual use cases are being built around Bitcoin a block chain. So I think the volatility we're seeing is really just a price discovery process. I think those who really sort of dismiss it as hey look there's no tangible value. For bitcoin are really losing some perspective it's not that different. In the 1990s someone saying Amazon is worth nothing because they actually don't make money and 20000 by June is very reasonable. June Yeah and then 25000 by the end of the year because that would look that would make it look like past 50 percent correct. I think in December last year there was this fear to get involved with crypto without really doing the work since the start of the year and there's been real authentic interest from our institutional clients and we're still doing meetings and teach ins and providing a lot of resources but there's not this need to be like identified and figure it out. So now these folks really trying to understand what are the 5 10 year drivers. And that's the kind of Holders you want in bitcoin. Let's say we think Kuzmich can reach 25000. It doesn't require bitcoin to go up every day till the end of the year. Remember the 10 best days account for all of return are Bitcoin. If he didn't own Bitcoin for 10 days each year. You lost 25 percent a year for the last since 2010. The notion of block chain as as a as a way to solve trust in a digital world has gained a lot of traction especially at a consensus and what investors aren't connecting is that. You can't necessarily just say I believe in the block chain bitcoin and crypto currencies are essential to how block chains operate in the securities but more importantly I think institutional investors have gained a lot of interest and they haven't really come into crypto yet because there's still some regulatory uncertainty what that sort of ultimate allocation to enter into crypto as an asset class is going to be a powerful reason why Bitcoin rallies bitcoin or U.S. equities here and here. Between now and year end you know we think the S&P can do. Mid to high single digit gains rate that would get twar roughly 3000. And I think Bitcoin. Can easily do well beyond that. You know we still think Bitcoin can reach 25000 by the end of the year when Bitcoin is trading 30 percent below its 200 day. It's a it's a huge pull signal because when we're ending the nearing the end of a correction but also if you look forward six months you're going to do pretty well owning that narrative. Crying you know kind of looked questionable for him because there were regulatory clampdowns that people proper protocol were broken. And people were losing interest. But I think now after everything you know the potential institutional participation again. And I think it's. Going to help bitcoin break back toward the all time high.